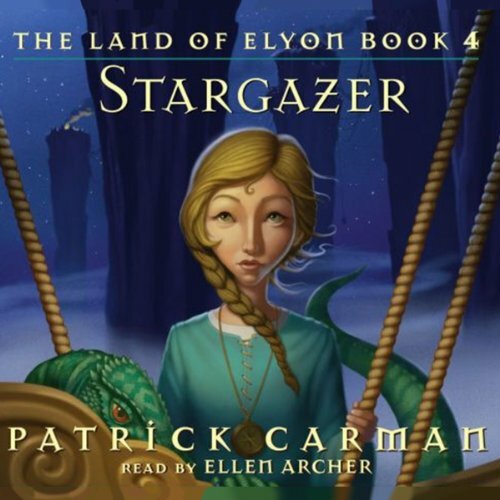 The captivating conclusion to Patrick Carman’s Land of Elyon series, Stargazer follows Alexa and company across the Lonely Sea to the mysterious land of the Five Stone Pillars. Unknowingly, Alexa has been followed by an evil sea creature, Abaddon, with designs to destroy the Five Stone Pillars. With help from her friends, Alexa comes up with a risky plan to defeat the monster. Audie Award nominee Ellen Archer brims with mystical intrigue and budding urgency as Alexa hurtles toward her journey’s conclusion. The vibrant voice actress deftly locates the sense of old-world enchantment, mythic proportion, and epic adventure that weaves throughout Alexa’s quest. When we last saw Alexa Daley, she had defeated a threat in her homeland and was sailing with Roland Warvold across the Lonely Sea. She had no idea what adventures awaited her...until now. After a tragic attack by an evil force, Alexa and her friend Yipes are stranded in a strange community known as The Five Stone Pillars. Each pillar of rock has its own secrets...and its own challenges. As darkness descends, Alexa must risk everything to defeat it - even if it means taking to the skies. ©2008 Patrick Carman (P)2008 Scholastic Inc.